Mutations of the SCN2A gene encoding a voltage-gated sodium channel alpha-II subunit Nav1.2 are associated with neurological disorders such as epilepsy, autism spectrum disorders, intellectual disability, and schizophrenia. However, causal relationships and pathogenic mechanisms underlying these neurological defects, especially social and psychiatric features, remain to be elucidated. We investigated the behavior of mice with a conventional or conditional deletion of Scn2a in a comprehensive test battery including open field, elevated plus maze, light-dark box, three chambers, social dominance tube, resident-intruder, ultrasonic vocalization, and fear conditioning tests. We further monitored the effects of the positive allosteric modulator of AMPA receptors CX516 on these model mice. Conventional heterozygous Scn2a knockout mice (Scn2aKO/+) displayed novelty-induced exploratory hyperactivity and increased rearing. The increased vertical activity was reproduced by heterozygous inactivation of Scn2a in dorsal-telencephalic excitatory neurons but not in inhibitory neurons. Moreover, these phenotypes were rescued by treating Scn2aKO/+ mice with CX516. Additionally, Scn2aKO/+ mice displayed mild social behavior impairment, enhanced fear conditioning, and deficient fear extinction. Neuronal activity was intensified in the medial prefrontal cortex of Scn2aKO/+ mice, with an increase in the gamma band. Scn2aKO/+ mice exhibit a spectrum of phenotypes commonly observed in models of schizophrenia and autism spectrum disorder. Treatment with the CX516 ampakine, which ameliorates hyperactivity in these mice, could be a potential therapeutic strategy to rescue some of the disease phenotypes. Approximately 5–6% of children are born with developmental disorders . Over the past few years, large-scale studies have identified a large number of mutated genes, among which one of the most recurrent is SCN2A . SCN2A encodes Nav1.2, a member of the voltage-gated sodium channels (VGSCs) family, essential players of the electrogenesis in excitable cells as they ensure the generation and propagation of action potentials. The first reported case of SCN2A mutations was found in a patient with atypical generalized epilepsy with febrile seizures plus (GEFS+) thought to be caused by a slower inactivation of the channel . Thereafter, several reports described missense mutations associated with benign familial neonatal-infantile seizures (BFNIS) [4–6] and multiple de novo missense mutations in epileptic encephalopathies (EE) [7–11]. The symptoms induced by a deficiency of SCN2A are however not limited to epilepsies. We previously identified the first de novo nonsense mutation in a patient affected by an association of intractable seizures, autism spectrum disorder (ASD), and intellectual disability (ID) . Since then, numerous case reports described de novo loss-of-function mutations in patients with ASD [13, 14], ID [15, 16], and more recently schizophrenia (SCZ) [17, 18]. Additionally, recent large-scale whole exome sequencing studies identified de novo mutations in SCN2A as the most frequent in patients with ASD, SCZ, or ID [19–23]. Considering the various mutations and the consequent phenotypic spectra, it is now recognized that SCN2A gain of (increased or accelerated but not toxic) function mutations lead to early infantile-onset severe EEs such as Ohtahara syndrome, while loss-of-function mutations cause ASD, ID, or SCZ with later-onset, milder or even without epilepsies [24–26]. Nav1.2 is dominantly expressed in the axon initial segment of glutamatergic neurons, in particular in neocortical pyramidal cells [6, 27–29] as well as in hippocampal dentate and cerebellar granule cells [30, 31]. Recent reports however also identified Nav1.2-positive medium spiny neurons (MSNs), suggesting that GABAergic inhibitory neurons also express this Nav1.2 channel . Our recent work confirmed this proposal given that a subset of caudal ganglionic eminence-derived inhibitory neurons (mainly vasoactive intestinal peptide (VIP)-positive or reelin-positive/somatostatin-negative) within the hippocampus and neocortex also express Nav1.2 . The contribution of these different Nav1.2 populations of neurons and the mechanisms leading to the various phenotypes observed in cases of mutations in the SCN2A gene however remain to be elucidated. In Scn2a haploinsufficient mice, we recently reported impaired excitatory transmission-dependent epileptic phenotypes mimicking later-onset milder epilepsies in ASD patients  and impairments in learning/memory and replay of hippocampal place cells . However, other aspects of the behavioral phenotype of the Scn2a-haplodeficient mice have not been fully investigated yet. Here, we undertook a comprehensive, in-depth investigation of the behavioral abnormalities of Scn2a conventional and conditional knockout (KO) mice and pharmacologically challenged the glutamate signaling system as a potential mechanism leading to hyperactivity in these mice. Our results show that Scn2a haploinsufficiency in mice lead to a spectrum of behavioral phenotypes that have been observed in common models of SCZ and ASD. All animal breeding and experimental procedures were performed in accordance with the guidelines of the Animal Experiment Committee of RIKEN Center for Brain Science and Fujita Health University. Animals were maintained on 12 h light/dark cycle with ad libitum access to food and water. All tests involved male adult mice and were conducted in the light phase of the light/dark cycle, except for the home-cage monitoring that covered both light and dark phases. Mice were given a minimum of 30-min habituation to the experimental room before the start of the tests. Experiments were conducted in a blinded manner. The composition of cohorts and age of the mice for every experiment are summarized in the Additional file 1: Table S1. For social behavior-related tasks, housing condition was homogenized across the different testing batches to prevent a bias as follows: for batches 1, 2, and 4, all mice were housed in groups of two to five individuals per cage until the novel open field test and were then individually housed. For batch 3, mice were individually housed for 3 weeks prior to test to establish a home-cage territory. For batch 5, mice were paired with an age-matched female for 2 weeks prior to test to establish a home-cage territory. For batch 6, mice were individually housed for 2 weeks prior to test. Scn2a conventional (Scn2aKO/+)  and conditional (Scn2afl/+)  KO, Empty spiracles homolog 1 (Emx1)-Cre knock-in , and Vesicular GABA transporter (Vgat)-Cre BAC transgenic  lines were described previously and maintained on a congenic C57BL/6J background. Mice, aged 8 weeks, were placed in a 60 × 60 cm square automated open-field homogeneously illuminated at 70 lx and allowed to freely explore for 30 min. Data was acquired and analyzed using manufacturer’s tracking software (TimeOFCR4; O’Hara & Co. Tokyo, Japan). A second 40 × 40 cm automated open-field illuminated at 100 lx was used to assess exploratory behavior for a longer period of 120 min (Accuscan Instruments, Columbus, OH, USA). The elevated-plus maze consists of two open arms (25 × 5 cm) crossing two enclosed arms of identical dimensions equipped with 15 cm high transparent walls placed 60 cm above the floor. Luminosity was homogeneously set at 70 lx. Male mice, aged 8 to 9 weeks, were placed at the center of the maze, facing one of the open arms and allowed to freely explore for 10 min. Data was acquired and analyzed using manufacturer’s tracking software (TimeEP2; O’Hara & Co. Tokyo, Japan). Adult male mice were injected with vehicle (saline, 10 μl/g of body weight) or CX516 (10, 25 or 40 mg/kg, diluted in saline for an injected volume of 10 μl/g of body weight; Sigma-Aldrich # SML1191) intraperitoneally 10 min prior to open field, elevated plus maze, and rotarod tasks. The light (250 lx) and dark (0 lx) boxes were two equal-sized plastic boxes (20 × 20 cm) separated by a central partition plate with a small 3 × 5 cm opening allowing mice to transit from one side to the other. Mice, aged 10 weeks, were placed on the dark side of the apparatus and allowed to freely explore for 10 min. Data was acquired and analyzed using manufacturer’s tracking software (TimeLD4; O’Hara & Co. Tokyo, Japan). The three-chambers apparatus is a rectangular 43 × 63 cm non-transparent gray Plexiglas box, separated into three equivalent-sized (21 × 43 cm) chambers by transparent Plexiglas plates with small openings allowing mice to freely transit from a chamber to another. One wire quarter-cylinder shaped cage was placed in the corner of each of the side chambers and was used to enclose a 7- to 8-week-old C57BL/6J stranger male mouse. 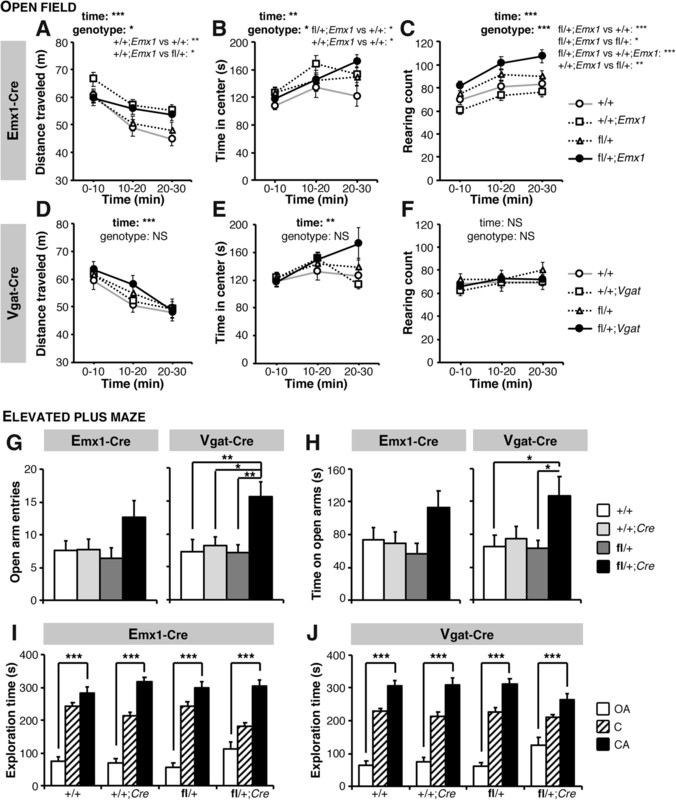 Tested mice, aged 12 ± 1 weeks, were first given a 10-min habituation to the apparatus. A first stranger animal was then placed randomly in a wire cage in one of the side-chambers and the tested mouse given a 10-min free exploration period. In a final step, a second stranger mouse was placed in the wire cage on the opposite side chamber and the tested mouse was given another 10-min exploration period. Data was acquired and analyzed using manufacturer’s tracking software (TimeCSI; O’Hara & Co. Tokyo, Japan). Male mice, aged 12 weeks, were individually housed for 3 weeks to establish a home-cage territory. An 8–9-week-old C57BL/6J female was then introduced for four consecutive 1-min-long confrontations spaced by a 10-min interval during which the female was removed from the cage. In each of the consecutive trials, the tested male was exposed to the same female. Ten minutes after the last confrontation, a novel C57BL/6J juvenile female was placed in the cage for 1 min. The total duration of sniffing interactions was monitored for all trials. Mice, aged 15 weeks, were first given individually a habituation run through the tube (cylindrical transparent Plexiglas, diameter: 3 cm; length: 30 cm; elevation: 2 cm) in dim light conditions (5 lx). Videos were recorded using an infrared camera. For each round of the test, one Scn2aKO/+ and one weight-matched WT mouse were introduced at each end of the tube, facing each other and released simultaneously. An animal was considered to have lost the confrontation when both of its posterior limbs touched the table, either from retreating or being pushed out of the tube. Each mouse was given four rounds facing a different randomly chosen opponent each time. Male mice, aged 9 weeks, were paired with an age-matched female for 2 weeks to establish a home-cage territory. The female was then removed from the cage and a 6–7-week-old Balb/c male was introduced for a 10-min confrontation. Data was acquired for every sniffing, pursuing, and attacking event by the resident mouse toward the intruder male. Two mice of the same genotype, aged 30 ± 1 weeks were placed in clean home cage equipped with an infrared video camera. Animals’ position was tracked over a week using an automated offline ImageJ-based analysis software (ImageHA, designed by Tsuyoshi Miyakawa, available through O’Hara & Co. Tokyo, Japan). Social interaction was evaluated by counting the number of objects detected in each frame: two objects were detected whenever the mice were not in contact, whereas only one object was detected when mice were in contact. Data was recorded for eight consecutive days and the values for days 4 through 6 were averaged. For the conditioning phase, 29-week-old mice were place in a transparent cubic box with a stainless steel grid floor in a soundproof chamber with a continuous 50 dB white noise background and homogeneously lit at 210 lx (O’Hara & Co). Mice were given 2 min for habituation and then received two pairs of conditioned stimulus (CS; white noise, 60 dB, 30 s) and unconditioned stimulus (US; electric foot-shock, 0.3 mA, 2 s) spaced by a 1-min gap. After the second CS-US pair, the animal was given 1 min to explore the box and returned to its home cage. For contextual testing (24 h later), mice were placed in the same environmental conditions than for the conditioning phase for 5 min without CS or US. The auditory-cued test was performed 24 h later in an alternative context different in shape (trigonal prism), color (opaque), brightness (50 lx), background white noise (60 dB), and flooring (paper-chips bedding, Alpha-Dri, Shepherd Specialty Products, Kalamazoo, MI, USA). Animal’s behavior was recorded for 2 min to evaluate the nonspecific contextual fear and the subject was then given a single CS (white noise, 65 dB, 2 min) without US. Mice were given a final 1-min period of free exploration. Mice freezing rate was automatically detected using the manufacturer’s software (O’Hara & Co. Tokyo, Japan). The conditioning phase was performed in the conditioning context described above using a set of mice independent from the group tested in the contextual and auditory-cued fear conditioning task. Mice, aged 13 weeks, were allowed to explore the box for 3 min and received three CS (CS; white noise, 60 dB, 30 s) US (US; electric foot-shock, 0.3 mA, 2 s) pairs spaced by a 1-min interval. The extinction test was performed 24 h later in the auditory-cued test context described above. Each mouse was given a 3-min free exploration period and was then exposed to ten consecutive CS (white noise, 65 dB, 30 s) spaced by a 30-s interval, without US. The probe test was performed 24 h later in the same auditory-cued test chamber. After 3 min of free exploration, mice were given three consecutive CS (white noise, 65 dB, 30 s) spaced by a 30-s interval, without US. Animals’ freezing rate was automatically detected using the manufacturer’s software (O’Hara & Co. Tokyo, Japan). Adult male mice (3–6 months) were used in these experiments. An antibiotic (ampicillin) was used in surgery. Stainless steel screws (1.1 mm diameter) serving as electrocorticogram (ECoG) electrodes were inserted through the skull in contact with the somatosensory cortex (± 1.5 mm lateral and 1.0 mm posterior from bregma) under 1–1.5% isoflurane anesthesia. A screw electrode in contact with the cerebellum was used as reference. Stainless wire electrodes (100 μm diameter) were inserted in the cervical region of the trapezius muscle to record electromyogram (EMG). To record simultaneous monopolar local field potential (LFP) of different brain regions, beveled-tip insulated stainless wires (200 μm diameter) were stereotaxically implanted contralateral to the ECoG electrode at the following coordinates (in mm; anterior-posterior, medial-lateral, depth from the cortical surface): medial prefrontal cortex (1.9, 0.3, 1.4), caudate-putamen (0.0, 2.4, 2.5), basolateral amygdala (− 1.4, 2.9, 3.7), ventroposterior thalamus (− 1.8, 1.5, 3.2), hippocampus CA1 region (− 2.5, 2.2, 1.1), visual cortex binocular zone (− 3.4, 3.0, 0.4). After at least 1 week of recovery, ECoG and LFPs were recorded for three consecutive days using a 16-channel commutator (Plexon, Dallas, TX). Animal’s behavior was continuously monitored using an infrared camera. LFPs (filtered 0.7–170 Hz, 1 kHz sampling) were recorded using the MAP data acquisition system (Plexon) and analyzed off-line using NeuroExplorer software (Nex Technology, Madison, AL). For power spectrum analysis, a 3-h window of LFP traces during daytime was divided into waking, slow-wave sleep, and rapid eye movement sleep stages, and the power spectra of these segments were calculated using NeuroExplorer (0–100 Hz, 0.390625 Hz bin). To compare absolute LFP powers, power densities corresponding to defined frequency ranges (e.g., gamma 30–80 Hz) were summed. The position of the electrodes was confirmed by sectioning and hematoxylin/eosin staining. Statistical significance was assessed using paired t test, Student’s t test, one-way ANOVA, or two-way repeated measures ANOVA with post-hoc Tukey’s or Sidak’s multiple comparisons test using Prism 7 (GraphPad Software, La Jolla, CA, USA). For experiments with unbalanced sample numbers, a REML mixed effect model was applied to process ANOVAs using Prism 7 software. Winning rate in the social dominance tube test was analyzed with a binominal Chi squared test with a 50% expected value. The values shown in graphs and reported in the text are expressed as mean ± SEM with statistical significance set at p < 0.05. General health examination of adult Scn2aKO/+ male mice did not reveal significant changes in gross morphology, body temperature, and sensory response (Additional file 2: Figure S1A-C, Additional file 3). Although muscular strength was unaffected in Scn2aKO/+ mice (Additional file 2: Figure S1D-E), the rotarod task revealed a significant deficit in locomotor coordination throughout six consecutive learning trials (Additional file 2: Figure S1F). We first investigated the spontaneous exploratory behavior using the open field task. Whereas in both Scn2aKO/+ and WT groups, the distance traveled decayed as a function of time spent exploring the open field; this effect was milder in Scn2aKO/+ samples and resulted in a significantly longer distance traveled in the second and third blocks of 10 min of the task (Fig. 1a). Scn2aKO/+ mice spent significantly more time exploring the center of the open field than their WT littermates (Fig. 1b). Additionally, the number of rearing events was drastically larger in the Scn2aKO/+ group (Fig. 1c). Further investigation showed that the enhanced locomotor activity, increased time spent in the center, and rearing counts in a novel open field lasted for at least the first 60 min of exploration (Additional file 2: Figure S2). We then used the elevated-plus maze test to further investigate anxiety-like behavior. The distance traveled and total number of arm entries were significantly larger in the Scn2aKO/+ group (Fig. 1d, e). The number of entries and time spent in the open arms were significantly increased in Scn2aKO/+ mice (Fig. 1f, g) and while WT mice showed substantial preference for the closed arms, this was not the case for Scn2aKO/+ animals (Fig. 1h). Although hyperlocomotion might affect the reading of anxiety-related parameters, the drastic increase in entries and time spent in the open arms (145% increase in open arm entries and 136% increase in time spent in the open arms) is unlikely to be caused simply by the modest increase in locomotion (15% increase in total traveled distance and 22% increase in total number of arm entries). Taken together, these results suggest that Scn2aKO/+ mice are hyperactive and less anxious than their WT littermates when exposed to a new environment. In the light/dark box test, no major differences in the latency to enter the light side and the total number of light/dark transitions were discerned (Fig. 1i, j). Surprisingly, however, Scn2aKO/+ mice spent significantly less time than their WT littermates on the light side (Fig. 1k). Although this observation would suggest an increase in anxiety, we observed robust signs of decreased anxiety in the open field and elevated-plus maze tasks. It should be noted that the luminosity used in the open field and elevated-plus maze (70 lx) is by far dimmer than in the bright area of the light/dark box task (250 lx). This raises the possibility of a higher sensitivity to intense brightness in Scn2aKO/+ mice affecting the outcome in this latter task, whereas they show a clear decrease in anxiety in the open field and elevated-plus maze, tasks commonly used to assess spontaneous behavior in rodents. Because Scn2a is expressed in both excitatory and inhibitory neurons , we sought to determine if a critical population of neurons was underlying the hyperactivity and increased rearing. We used conditional KO Scn2afl/+/Emx1-Cre and Scn2afl/+/Vgat-Cre mice carrying a selective heterozygous deletion of Scn2a in dorsal-telencephalic (e.g., neocortex, hippocampus) excitatory neurons and inhibitory neurons respectively [36, 37]. The effective Cre-loxP-guided recombination in these conditional knockout models has been confirmed in our previous work . Scn2afl/+/Emx1-Cre mice appeared to travel slightly longer distances than WT mice, but this did not reach the significance level (Fig. 2a). Scn2afl/+/Emx1-Cre mice spent significantly more time at the center of the open field, but the significant increase in the Emx1-Cre group suggests that this genetic modification itself might be interfering (Fig. 2b), as they also showed a significant increase in distance traveled (Fig. 2a). In addition, the rearing count in the Scn2afl/+/Emx1-Cre group was significantly increased compared to their WT, Scn2afl/+, and Emx1-Cre littermates (Fig. 2c), mimicking our observations in the Scn2aKO/+ group (Fig. 1c). In contrast, Scn2afl/+/Vgat-Cre mice showed no significant alterations in the distance traveled, time spent in the center of the open field, and rearing counts throughout the whole exploration period (Fig. 2d–f). These results suggest that Nav1.2 dysfunction in dorsal-telencephalic excitatory neurons underlies the novelty-induced increase in vertical activity. We next assessed whether conditional deletion of Scn2a in excitatory or inhibitory neurons had an impact on anxiety-like behavior in the elevated-plus maze task. The number of entries and time spent in the open arms tended to be larger in Scn2afl/+/Emx1-Cre mice and was significantly larger in Scn2afl/+/Vgat-Cre mice than in their respective controls (Fig. 2g, h), as observed in Scn2aKO/+ mice (Fig. 1f, g). Scn2afl/+/Emx1-Cre and Scn2afl/+/Vgat-Cre mice however showed a significant preference for the closed arms over the open ones (Fig. 2i, j), whereas Scn2aKO/+ animals failed to show this pattern (Fig. 1h). In this task, the total number of arm entries and total traveled distance were not significantly different across the groups suggesting that the increase in open arm entries and time spent in the open arms are unlikely to be caused by hyperlocomotion (Additional file 2: Figure S3). These observations suggest that Nav1.2 dysfunction in inhibitory cells induces a decrease in anxiety-like behavior in the elevated plus maze, but the combined contribution of both neuron populations appears to be required to observe the stronger phenotype seen in Scn2aKO/+ mice. As the enhanced rearing observed in Scn2a KO mice was reproduced by a selective Scn2a deletion in dorsal-telencephalic excitatory neurons, we hypothesized that acting on the glutamatergic system would help recover phenotypes affecting spontaneous exploration. To challenge this hypothesis, we used intraperitoneal injections of CX516, a specific AMPA receptor positive allosteric modulator, administered 10 min before proceeding to the open field task. Testing this treatment at three different concentrations (10, 25, and 40 mg/kg) did not affect significantly WT animals but appeared to decrease the activity of Scn2aKO/+ animals with a maximal effect seen at 40 mg/kg (Additional file 2: Figure S4). As observed in non-treated Scn2aKO/+ mice, saline-injected Scn2aKO/+ animals traveled significantly longer distances and reared significantly more than their saline-injected wild-type (Scn2a+/+) littermates (Fig. 3a, b). 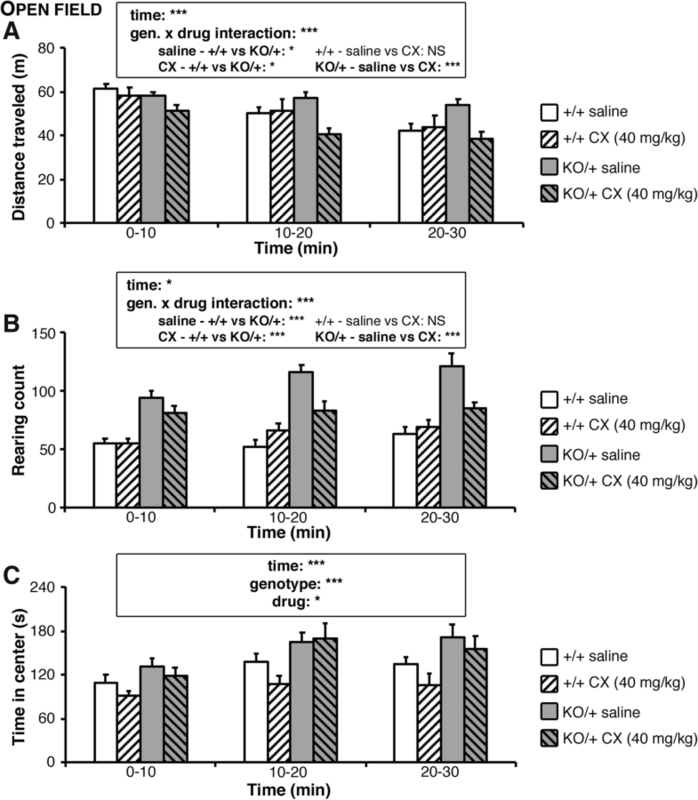 Although CX516 did not affect significantly wild-type mice, we observed a significant decrease in traveled distance and rearing counts in the Scn2aKO/+ group especially pronounced in the second and third blocks of 10 min of the task, reaching a level even significantly lower than in the WT groups (Fig. 3a, b). Saline-injected Scn2aKO/+ mice showed an increase in time spent in the center area in the open field and in the open arms in the elevated-plus maze compared to their saline-injected WT littermates (Fig. 3c, Additional file 2: Figure S5). Treatment with CX516 however did not affect significantly these parameters. Although a significant, non-genotype-specific drug effect was observed in the time spent in the center of the open field, the extent of this effect remained minor in comparison to what was seen in terms of traveled distance and rearing count. As observed in our previous work , CX516 injections did not alter animals’ locomotor performance in the rotarod task (Additional file 2: Figure S6). These results thus indicate that the positive regulation of AMPA receptors by an ampakine effectively ameliorates novelty-induced hyperactivity and increased rearing in Scn2aKO/+ mice without however affecting their low anxiety-like behavior. We next assessed the social performance of Scn2aKO/+ in the widely used three-chamber test [39, 40]. In the habituation phase, animals from both groups did not show a significant preference for one side chamber over the other (Additional file 2: Figure S7). In the “sociability” phase of the task mice from both groups showed a significant preference for the stranger mouse over the empty side of the maze (Fig. 4a) but Scn2aKO/+ mice spent slightly yet significantly more time investigating the stranger mouse than their WT littermates. In the “preference for social novelty” phase of the task, Scn2aKO/+ and WT mice showed significant preference for the novel stranger over the familiar mouse and no significant genotype-effect was observed (Fig. 4b). In the context of the three-chamber task, the sociability and preference for social novelty are thus conserved in Scn2aKO/+ mice. We next investigated social memory in a different context using a direct interaction task. The interaction time decreased throughout the four consecutive exposures to the same intruder and increased when a new female on the fifth trial replaced this intruder, without significant differences between Scn2aKO/+ mice and their WT littermates (Fig. 4c). The time spent investigating the new female appeared shorter in the Scn2aKO/+ group but this effect did not reach the significance level (paired t test; P = 0.1044), overall suggesting that social memory was not altered in Scn2aKO/+ mice. We then challenged the social hierarchy and dominance of Scn2aKO/+ mice using the tube test, matching KO mice to randomly selected WT littermates. The winning rate of Scn2aKO/+ mice was significantly higher than the 50% expected by chance, suggesting a dominant behavior in the mutant group that underwent the behavioral testing battery (Fig. 4d, Chi-squared test; p = 0.0105). In contrast, naïve Scn2aKO/+ without prior experience of behavioral tasks had a winning percentage that did not differ significantly from a random outcome (Chi-squared test; p = 0.601). No marked aggressive behavior was observed during the encounters in both experiments. These observations suggest a dominance behavior in Scn2aKO/+ mice that is likely consequent to previous experience in social and potentially non-social tasks. Last in the series, we investigated the social behavior of Scn2aKO/+ mice in their home cage toward either a young intruder male (resident-intruder’s test) or toward a familiar male in a 24-h monitoring paradigm. In the resident-intruder test, the latency to the first sniffing interaction was significantly longer in the Scn2aKO/+ group suggesting a deficit in social approach toward a stranger male (Fig. 4e). Additionally, the total number of sniffing events was significantly lower in Scn2aKO/+ mice, whereas the number of nose-to-nose contacts, chasing, and attack events did not differ significantly between the groups (Fig. 4f). In the 24-h interaction test, in which WT-WT or Scn2aKO/+-Scn2aKO/+ pairs were monitored, we did not observe significant differences in interaction time in either active or inactive periods (“dark” and “light” respectively, Fig. 4g). Taken together, these results suggest a decrease in approach behavior toward stranger mice in familiar environments, whereas interactions with familiar mice and social interactions in novel environments are not significantly affected in Scn2aKO/+ mice. In addition to these physically characterized social interactions in adult mice, we investigated isolation-induced ultrasonic vocalizations (USV) produced by juvenile male mice at postnatal day 6 (P6; Additional file 2: Figure S8, Additional file 3). No significant differences in basic parameters including the number, duration, frequency, frequency modulation (i.e., the difference between the minimum and peak frequencies within each call), and amplitude (dB) of calls were found between Scn2aKO/+ and their WT littermates (Additional file 2: Figure S8A-F). Classifying all calls produced into the ten main typical categories identified in C57BL/6J mice showed that Scn2aKO/+ pups produce a repertoire of vocalizations highly similar to their WT littermates (Additional file 2: Figure S8G-H) [41, 42]. Social communication was thus not significantly affected in Scn2aKO/+ mice. We next assessed emotional state in Scn2aKO/+ mice using the two most common tasks used to detect depression-like behavior in rodents: the forced swim test (FST) and the tail suspension test (TST). In the FST, the percentage of immobility increased significantly over the 10-min course of the task in WT and Scn2aKO/+ mice but this effect was enhanced in the mutant mice (Additional file 2: Figure S9A, Additional file 3), and this effect was still observed, though milder, approximately 24 h later. Consequently, the distance traveled by Scn2aKO/+ mice on the first day was significantly decreased but unaltered on the second testing day (Additional file 2: Figure S9B). In contrast, Scn2aKO/+ mice were significantly less immobile than their WT counterparts in the TST (Additional file 2: Figure S9C). Taken together, these results indicate that Scn2aKO/+ mice have an aberrant behavior divergent in two different tasks commonly used to screen depression state. Although these two parameters are both meant to detect behavioral despair in mice, they involve different pathological mechanisms: reportedly, FST is dopamine-dependent, whereas TST relies on both the serotoninergic and dopaminergic system and this led to discordant observations in the pretreatment of a chemically induced model of negative symptoms with clozapine . This led authors to suggest that the FST is more appropriate to study avolition in models of SCZ. Deficiencies in startle prepulse inhibition (PPI) have been observed in patients with SCZ and in SCZ model mice [44, 45]. We did not observe significant differences in the startle responses and PPI between Scn2aKO/+ and WT mice (Additional file 2: Figure S9D-E). Next, we subjected Scn2aKO/+ mice to different paradigms in the fear conditioning task. Two consecutive auditory cues paired with a foot-shock aversive stimulus resulted in a significant increase in freezing behavior in both Scn2aKO/+ and WT groups without significant genotype-linked differences (Additional file 2: Figure S10A). Thus, Scn2aKO/+ mice associated the auditory conditioning stimulus (CS) to the aversive foot-shock stimulus (unconditioned stimulus, US). After 24 h, when placed in the same environment without exposure to either CS or US, Scn2aKO/+ mice showed a tendency to freeze more than their WT littermates without however reaching the significance level (Additional file 2: Figure S10B). On the following day, mice were exposed to the auditory stimulus (CS) without the aversive US in a new context. At the onset of the auditory cue, we observed a significant increase in the freezing rate in both WT and Scn2aKO/+ groups (Additional file 2: Figure S10C). The freezing rate was however significantly higher in the Scn2aKO/+ group for the whole period of the task. As we did not observe differences in freezing behavior in Scn2aKO/+ mice prior to conditioning (Fig. 5a), this higher freezing on the third day is likely to be a consequence of the fear conditioning rather than a genuine enhanced freezing behavior in these mice. Taken together, these results led us to suspect an enhanced fear conditioning retention in Scn2aKO/+ mice. We next investigated the memory extinction ability of Scn2aKO/+ mice. For that purpose, we used a different set of subject mice in order to prevent any residual effect from a past experience in the fear-conditioning task. The freezing rate increased with the successive exposure to CS-US paired stimuli indicating a successful conditioning in Scn2aKO/+ and WT mice, and it resulted in a significantly higher freezing rate on the third CS-US pair in Scn2aKO/+ mice suggesting a stronger conditioning (Fig. 5a). After 24 h, mice were placed in the same environment and exposed to ten consecutive auditory-cues without foot shock. Scn2aKO/+ mice showed a persistent strong response to successive stimuli compared to their WT littermates and their freezing behavior only started to decay after the 7th exposure to the CS auditory cue (Fig. 5b). In order to assess whether successful fear extinction occurred, we analyzed the freezing rate at each CS presentation using the average freezing rate during the initial three minutes habituation period as reference (Fig. 5c). In WT mice, the freezing rate was significantly higher at CS1 and CS2 before returning to a level not significantly different from the reference. Scn2aKO/+ mice however showed a freezing rate significantly higher than their reference level from CS1 through CS6 before returning to a level comparable to the reference state. A similar persistent freezing behavior was still observed 48 h after the conditioning phase (Additional file 2: Figure S11). Taken together, these results suggest that the response to fear-conditioning is enhanced in Scn2aKO/+ mice, whereas the extinction of fear-related memory appears significantly impaired. Because the medial prefrontal cortex and in particular its activity in the gamma band are involved in the consolidation and extinction of fear memories  and abnormalities have been reported in the cerebral electric activity in models of SCZ and ASD [47, 48], we electrophysiologically investigated the cerebral cortex of Scn2aKO/+ mice. Apart from minor epileptiform patterns , electrocorticogram (ECoG) recordings did not show significant differences in power spectrum density in transcranial brain surface activity in Scn2aKO/+ mice during awake periods (Fig. 5d). However, local field potentials (LFPs), providing local activity within various regions of the brain, revealed a significantly higher activity in the gamma-band (30–80 Hz) in the medial prefrontal cortex (mPFC) of Scn2aKO/+ mice (Fig. 5d-e). In this study, we completed the first comprehensive behavioral characterization of Scn2aKO/+ mice. The first striking observation was a novelty-induced hyperactivity (in the sign of longer distance traveled and increased vertical activity) associated with a decrease in anxiety in this model. Hyperactivity is a robust symptom frequently observed in rodent models of SCZ [49–51]. Remarkably, this hyperactivity was recovered by treating Scn2aKO/+ mice with a potentiator of AMPA receptors and the increased rearing was reproduced by eliminating one of the Scn2a alleles specifically in dorsal-telencephalic excitatory neurons. Aside from the “increased dopaminergic signaling” hypothesis in SCZ [49, 52], a second co-existing model involves a deficient glutamatergic signaling focused on the role played by NMDA receptors [50, 51]. Our data are consistent with this alternative proposal and suggest that potentiating AMPA receptor activity is a plausible strategy to rescue hyperactivity. Recent large-scale studies have identified mutations in SCN2A in cases of SCZ resistant to clozapine, an antipsychotic drug acting on dopamine, serotonin, acetylcholine, and noradrenaline receptors commonly used to treat negative symptoms of SCZ [17, 18]. These reports however fail to describe the exact phenotype observed in such patients. In the most commonly used diagnosis screen (DSM-IV), SCZ is identified by the presence of at least two symptoms from a list of positive (hyperactivity, hallucinations, delusions, thought disorders…) and/or negative (affective blunting, reduced expression of emotions, avolition, memory impairment…) behavioral markers combined with abnormal social behavior . Whereas hallucinations and delusions are difficult to investigate in mice, the study of various genetic models helped identify key behavioral markers . 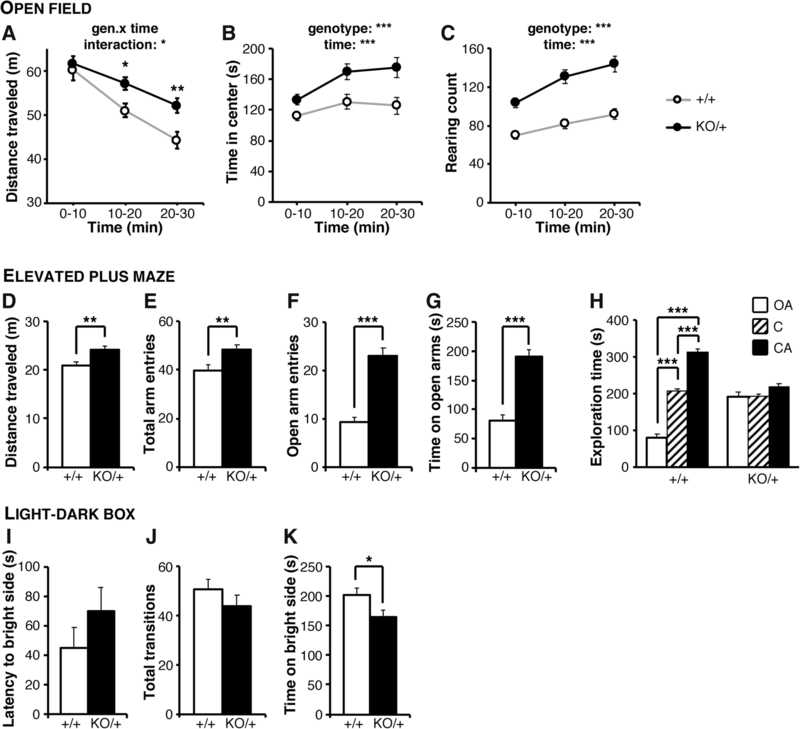 In addition to novelty-induced hyperactivity, Scn2aKO/+ mice displayed an increase in contextual fear memory consolidation and a deficit in locomotor coordination resembling the sdy dysbindin mutant mice [54–56]. Though milder than the spectrum of social deficits reported in other SCZ models , we observed a decrease in social behavior approach coupled with an experience-dependent social dominance in Scn2aKO/+ mice. These mice also displayed signs of depression-like behavior in the forced-swim test, a task proposed as a way to detect avolition-like behavior in mice , even though further work is required to understand why the tail suspension task showed contradictory results. Startle response and prepulse inhibition, a standard assessment of sensorimotor gating deficient in several models of SCZ [56–58], were however unaffected in Scn2a mutant animals. From the precise case reports of ASD patients with SCN2A loss-of-function mutations, the psychomotor delay consistently appears along with primary autistic features: deficits in sociability and communication and repetitive behavior [12, 14–16]. Such deficits are associated with less penetrant phenotypes such as febrile seizures and hyperactivity . Our Scn2aKO/+ mice recapitulate part of these behavioral phenotypes (locomotor dysfunction, decreased social approach, hyperactivity) but we did not observe communication deficits in juvenile mice nor specific signs of repetitive behavior. Circling behavior or excessive grooming did not accompany the increased rearing behavior in the open field and is thus likely due to the hyperactivity observed in these animals. Moreover, whereas Scn2aKO/+ mice appeared less sensitive to novelty and elevation-induced anxiety, they were more sensitive to the intense brightness in the light/dark box task. Overall, Scn2aKO/+ mice display a small subset of the main behavioral markers characteristic of ASD, together with an ensemble of SCZ-like phenotypes. This observation is consistent with human genetics as mutations in SCN2A have been observed in patients of both ASD and SCZ and as there is growing evidence that ASD, SCZ, and ID overlap both in terms of phenotype and candidate genes . Among these overlapping patterns, associative memory and emotion-driven behavior are affected in patients with ASD  as well as in persons affected by SCZ . The contextual fear conditioning is the reference task used to decipher these parameters in rodents. In the present study, contextual fear learning was enhanced and the extinction of fear-related memory decreased in Scn2aKO/+ mice. Similar results have been reported in models of ASD  and SCZ [54, 55]. Fear-related behavior relies on a complex network involving amygdala and the medial prefrontal cortex (mPFC) [61, 62]. Whereas the function of this network is difficult to assess in the human brain, several reports pointed to abnormal activity in the gamma band in the prefrontal area of the brain from patients with SCZ [63, 64]. Similarly, the neuronal activity in the gamma band was increased in the mPFC of Scn2aKO/+ mice. The co-occurrence of a deficit in fear memory extinction and abnormal mPFC activity suggests that a deficit in the mPFC-amygdala circuit might underlie the behavioral phenotype in our model mice. 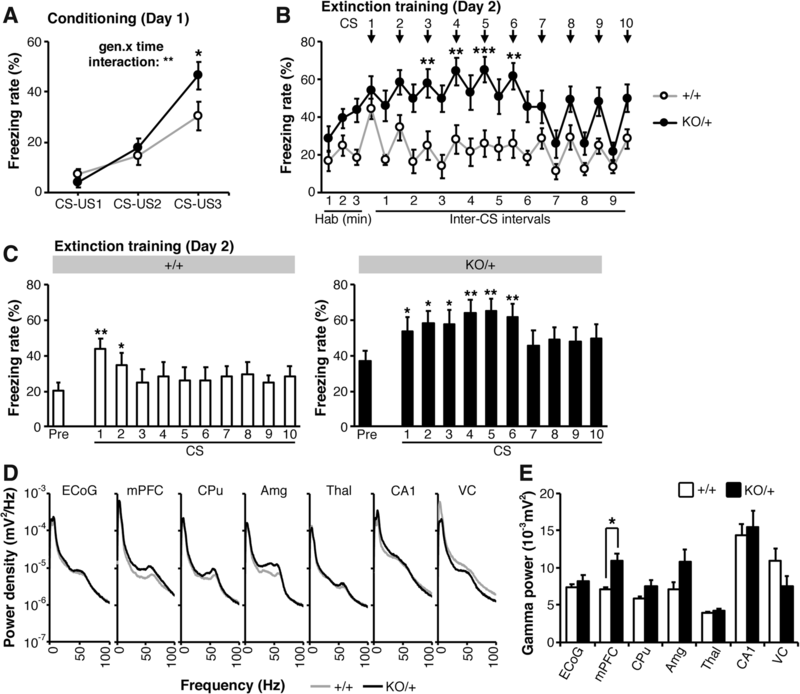 Recent work described more precisely the involvement of the locus coeruleus (LC) noradrenergic system in the control of fear learning and extinction via a modulation of input to the amygdala and mPFC . Further work addressing the LC-amygdala-mPFC in Scn2a mutant mice will provide valuable insights into potential mechanisms leading to their behavioral phenotypes. Scn2aKO/+ mice display a set of abnormal phenotypes overlapping patterns that have been observed in model mice of SCZ and ASD. Our data are consistent with the notion that enhancement of glutamatergic transmission restores aspects of some of these phenotypes. This is especially important given the fact that a number of mutations in SCN2A were identified in patients with antipsychotic drug-resistant SCZ and that such drugs are actually ineffective in most SCZ patients [17, 18, 66]. Tetsuya Tatsukawa, Matthieu Raveau and Ikuo Ogiwara contributed equally to this work. The authors thank Dr. Kaneda (Nippon Medical School) for his support. This work was supported in part by grants from the RIKEN Center for Brain Science; AMED JP18dm0107092 and MEXT Grants-in-Aid for Scientific Research (A) 17H01564 to KY; MEXT KAKENHI 19790747, 21791020, 16 K15564 to IO, and 16H06276 to TM; NIH GM-49711 to MM; and by a “Joint Usage/Research Center for Gene, Brain and Behavior”. TT, MR, IO, TM, MM, and KY designed the study. KY supervised the study. IO, TM, and KY acquired fundings. TT, MR, IO, SH, HM, and EM conducted experiments, processed data, and interpreted results. TT, MR, IO, and KY wrote the manuscript with contributions and revisions from all authors. All authors read and approved the final manuscript. All animal breeding and experimental procedures were performed in accordance with the guidelines of the Animal Experiment Committee of RIKEN Center for Brain Science and Fujita Health University.